At least 15,000 Syrian refugees fleeing fighting in northern Aleppo province have gathered at a border crossing with Turkey, UN and Turkish officials said. The frontier is shut but Turkey has said it is prepared to feed and shelter the refugees. In the past few days, the Syrian army backed by Russian air power has made a series of gains in Aleppo province. The advance threatens to surround the city of Aleppo, Syria's largest, landing a major blow to the rebels. Nato has accused Russia of "undermining" Syrian peace efforts through its strikes, which it says are mainly aimed at opposition groups. Russia insists it only targets what it calls terrorists. US Secretary of State John Kerry said talks were under way about a ceasefire to provide humanitarian access in Syria and the next few days would determine if "people are serious, or people are not serious". Who is to blame for peace talks' suspension? On Friday, Turkish President Recep Tayyip Erdogan accused Russia of being engaged in an "invasion" of Syria, saying it was trying to create a "boutique state" for ally President Bashar al-Assad. Mr Erdogan said Russia and the Syrian government were together responsible for 400,000 deaths in Syria. On Thursday Russia accused Turkey, key backer of Syria's opposition, of preparing a ground invasion, an accusation Mr Erdogan called "laughable". Turkey and Russia have been embroiled in a row since Turkey shot down a Russian jet it accused of violating its airspace in November. 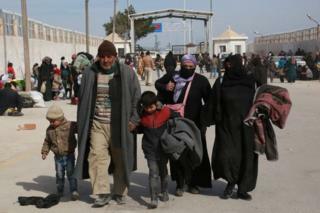 According to the UN, up to 20,000 Syrians have gathered at the Bab al-Salam border crossing. "Humanitarian organisations are responding to the needs of those displaced, but ongoing military conflict is making access to populations in need increasingly difficult," the UN's Linda Tom told the AFP news agency. She said another 5,000-10,000 displaced people had gathered at Azaz, a north-western Syrian city close to the Turkish frontier. Separately, Turkish Prime Minister Ahmet Davutoglu said 15,000 people had arrived at the border and that many more were on their way. In a televised speech, he said Turkey would not leave them "without food or shelter" but would not say if they would be allowed in. Image caption The UN warns that ongoing fighting is making providing aid "increasingly difficult"
Friday saw further gains for the Syrian government on the ground, with its forces recapturing the town of Ratyan, north of Aleppo. Earlier in the week, it claimed a major victory by breaking the rebel siege of two towns in Aleppo province, severing an opposition supply line from Turkey to Aleppo city. "It feels like a siege of Aleppo is about to begin," said a spokesman for aid group Mercy Corps, David Evans, who said the main humanitarian route had been cut off. Since 2012, Aleppo has been divided into rebel and government-held areas. Before the conflict it was a key commercial centre and home to over two million people. What is the Syria conflict? Anti-government protests developed into a civil war that, four years on, has ground to a stalemate, with the Assad government, the Islamic State group, an array of Syrian rebels and Kurdish fighters all holding territory. Government forces concentrated in Damascus and the centre and west of Syria are fighting the jihadists of Islamic State and al-Nusra Front, as well as less numerous so-called "moderate" rebel groups, which are strongest in the north and east. These groups are also battling each other.